Today I had a shoot (happens 2 to 4 times per year) for the Michelin starred chef Nicolas Magie. There is no cheating, it's real food, no paint, varnish and the like as often. A pentax 645 Z + 90 mm, 55 mm and 120 mm, two led panels and a flash light mounted on the camera and… day light was what I needed! But the glass should have some bubbly in it, no? I shall wash down the caviar and oysters with coke! I think the plain tea might go best as the caviar has a lot of salt. But what about Saint-Emillion? How sugary can that be, or is it dry? To the "These insufferable ignorant Americans!!! ": Saint-Emillion is ALWAYS "dry". I suspected that! I couldn't imagine anything sweet with caviar. But it does show my lack of refined upbringing! Who would have believed, way back, when I grew up in London, that an Englishmen would look to France for taste and class! Nicolas... what is this image for ? For the pleasure (at least for mine!). Personally I would go for Vodka with caviar. Hear! Hear! And some "black" (i.e.) rye bread. The most delicious caviar picture ever! But is it upside down? Because my view cameras always show an upside down image on the ground glass I get habituated into flipping pictures in the mind's eye. Either way, still tasty. 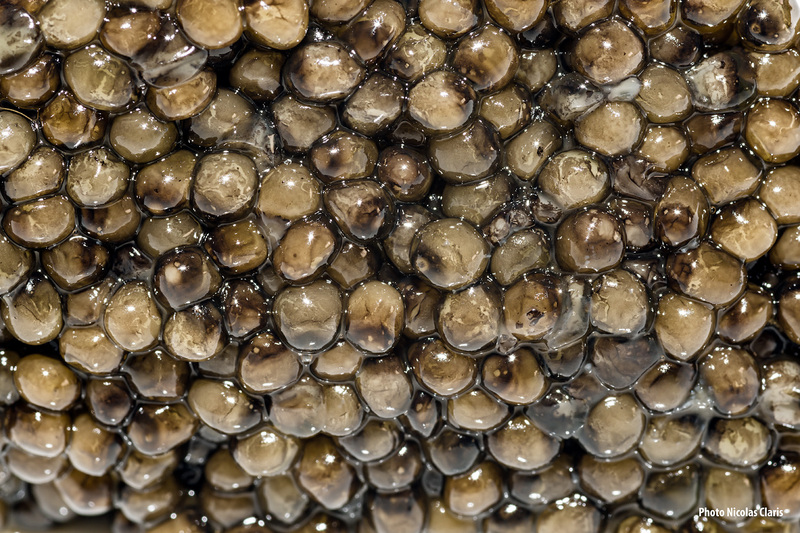 The caviar was moulded in a spoon then delicately dropped on a plate, this is why you may think that it is upside down (due to the spoon shape).